1. ZAPP is open to all active principal and supplementary PNB issued credit cards in good credit standing except Corporate Cards. 2. 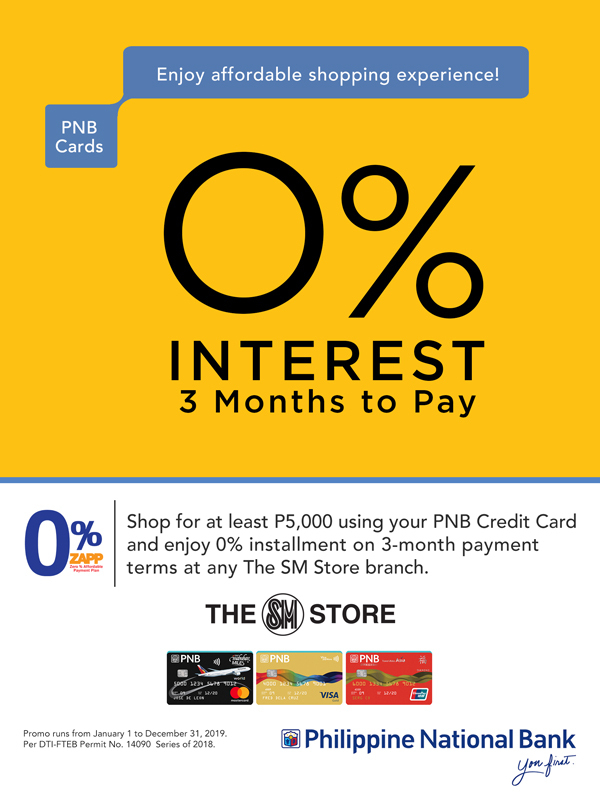 Minimum installment amount is P5,000 on selected items, 0% installment on 3-month payment terms. Available at all The SM Store branches. 3. 0% interest is subject to bank approval and valid if the total amount due is paid in full. 4. The monthly installment amount shall be posted as a regular transaction on the credit card account and shall form part of the total outstanding balance. Should the cardholder choose to pay only a portion of the total amount due but not less than the minimum amount due, the monthly installment shall be subject to the regular finance charges. 5. Cardholder may request to charge the full amount of the remaining unbilled amortization subject to PNB’s approval. A processing fee of 5% of the total balance or Php500, whichever is higher, shall be charged to the cardholder’s account. The unpaid total installment amount plus the applicable fees will form part of the outstanding balance and subject to monthly finance charge. 6. All 0% installment transactions posted in the Cardholder’s account shall earn Rewards Points/Miles. Points/Miles will be reflected in the SOA upon posting of the monthly amortization. 10. In case of dispute, PNB has the final decision upon approval of DTI. Per DTI-FTEB Permit No. 14090 Series of 2018.